Get your imagination flowing with this prompt-filled writing journal. For many people, creative writing sounds fun but intimidating. "I'm not good at that," they think, without even knowing where they’d start. Experienced writers, on the other hand, may know exactly where to start, but have plenty of other excuses for not putting pen to paper: too busy, too tired, or the dreaded "writer's block." The solution for both is the same: just start writing. This handy workbook will give you plenty of fun, low-pressure opportunities for you to get your imagination flowing. Collected from the minds and notebooks of the San Francisco Writers' Grotto, the book's prompts range from personal reflection, to silly lyric writing, to character development, and everything in between and beyond. Take them seriously or just have fun. Grab a pen, open this book to any page, and find the writer inside you. Printed in China. 9" H x 7.5" W; 304 pages. My son, who is a college student, loved this gift. I bought this as a stocking gift for my 15 year old daughter who loves to write. She has enjoyed going through it and has already picked out some ides from the book that she is going to use to write a creative story. Also it was well made, sturdy and came wrapped in plastic covering so nothing was bent. This product is a gift so I haven't seen beyond the sample provided online but the questions I have seen are really thought provoking and neat. I am excited to present this gift to a friend who has embarked on the arduous journey of becoming a writer and hope it is inspirational to him in challenging times. Sometimes you just need to get the juices flowing! I took a second look and liked it! I bought this as a gift for my 14-year-old grandson, figuring that a shy kid who doesn't talk about "feelings" much might have trouble coming up with ideas for school writing assignments. 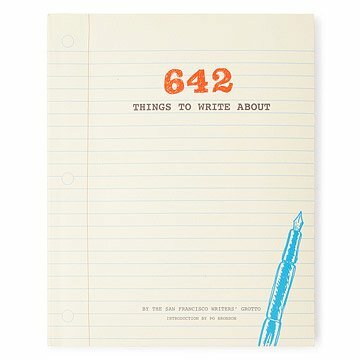 The book does what the title suggests: gives 642 topics that people can write about. Examples: "On becoming a tycoon," "You bring someone back from the dead. Who is it?" "Put your iPod on random shuffle, write down the lyric of the first song that comes on, and use it as an opening line," "Write wedding vows. The bride is 35 years old; it's her first marriage. The groom is 48, and it's his third go-round at the altar." When I first opened it, I came across a topic that was a bit on the mature side, and figured this wouldn't work for my grandson. But looking at it again, I realized that mature subjects are the rare exception, not the rule. So it WILL go to my grandson. I hope that the tips in the book will serve as an impetus to get him writing! You don't even need paper. The book leaves anywhere from a quarter page to a full page (lined) to explore the subject. Now I am tempted to get another copy for myself. As a member of a memoir-writing group, I could use these prompts from time to time, and I find the suggestions very motivating. This book is such a terrific gift idea for any one who wants to write more but is unsure where to begin. Bought this as a gift and think the recipient will enjoy it. totally inappropriate for teens!!! i bought 2 and will be returning both. very disappointing. Bought it for a young poet, hoping he mightlike writing about things he had not considered before.